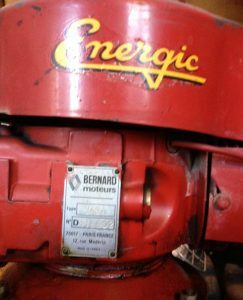 Motor Bernard W 249A Engine (No D) 4 stroke/temp. Engine/Moteur. Bernard W249A, 4.5cv, single cylinder, 181cm3, alésage 62m/m x course 60 m/m, 4 stroke. Lubrication. Oil circulation in 4 strokes. Starting. By handle pull cord. Air filter. Filter in a bath of oil/à bain d’huile. Gears. 2 models available; A) Monovitesse and B) 3 forward gears and 1 reverse. Multi speed/vitesse. It is possible to obtain 2 speeds by adding a sprocket gear- option of 7 speeds/gears by application of sprocket at different ratios. Exhaust/Silencer. Fitted to the left hand side in a frontal position (viewed from the rear looking forward), away from the driver. 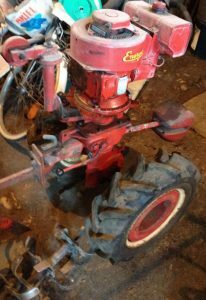 Energic Rubis lifting the moteur to be transformed into a Faucheuse/motobineuse/motoculteur. 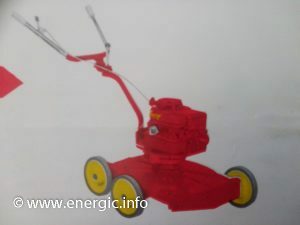 Energic Rubis transformed into a Faucheuse using a ILO moteur. 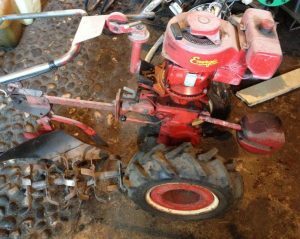 Energic Rubis using a Briggs & Stratton moteur adapted/transformed into a lawn mower/tondeuse. 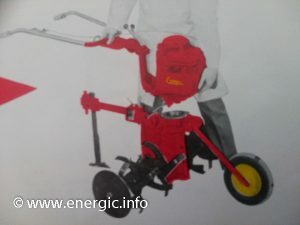 Energic Rubis using a Briggs & Stratton moteur motoculteur transformation/adaption. Steering. Handle bars, which are regularable. Wheels. I supporting wheel to move the machine, tilt weight forward. Fuel consumption. 0.6 to 1 liters of fuel per hour dependent upon working conditions. The tank holds approx. 2.5 liters. Throttle control. Operated from beneath the right hand side of the handle bars. Weight. Dependant upon the type, see above. approx. 35kg. Working widths between .22m and 1.2m. Adaptions. 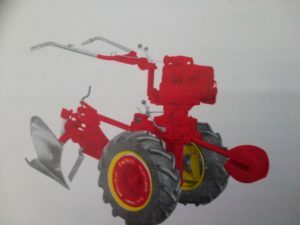 For hoeing/binage 7 setting between 10 to 53cm, for buttage 5 settings between 15 to 46cms. 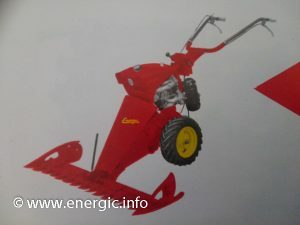 Grass cutter up to 1.2m, plow/buttoir, hitch remorque, wheeled micro tracteur for pulling etc.